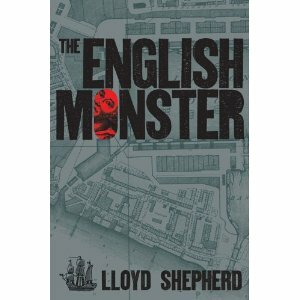 The English Monster is Lloyd Shepherd’s debut as a novelist, but not as a writer. 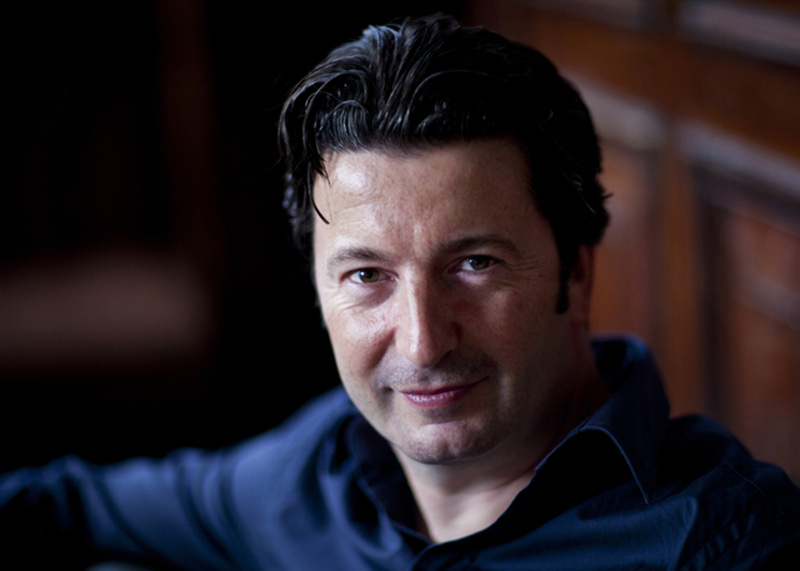 He has a distinguished career in journalism, especially in financial journalism relating to the television and film industries. This powerful first novel is built on solid fact, as it takes notorious Ratcliffe Murders of 1811 as its focal point. Its scope however ranges far beyond that both in time and location. As asuccessful journalist, what attracted you to fiction writing? Have you experimented with fiction over the years? Well, I don’t know about “successful” journalist! I’d be happy with “competent.” Yes, I’ve always written fiction, and I did complete a novel ten years ago, called Woman’s Work. It was OK, and an agent did show some interest, but they wanted me to work on extensive rewrites. At the time I had a new job and a young family, and I just couldn’t spare the time. I thought that meant I didn’t want to write enough, but the itch kept itching. I stopped writing fiction for more than five years, and then got back in the saddle for The English Monster. Was your experience as a journalist experience a help or a hindrance during the transition to fiction? For instance, one journalist might find it hard to adapt to the longer length novel form whereas another might find that the experience of writing concisely and to the point an advantage in turning to fiction. Or perhaps other aspects helped or hindered? The thing that journalism gives you is the sense that writing is a craft; something to be worked at and practised and developed. Something like a job. When you make your living hammering words into coherence - either your own words or someone else’s - you soon develop a toolkit for writing which is always there, even on the days when there’s no inspiration coming at all and you’re staring at an empty screen with nothing to say and no way of saying it. On a days like that, you just have to fall back on the toolkit you’ve developed: concision, grammar, sentence structure, flow. You keep at it, and eventually good things happen. Or, as my daughter would say: shut up and get on with it, Dad. The English Monster has a fascinating structure of different ages and eras. Did you plan that from the beginning or did it emerge as the plot of the novel evolved? Thank you! It emerged from the concept, really; that these murders were in some strange way an end-note to three hundred years of British history. Once I had the idea of England’s first slaving voyage being a key component - well, I had to find a way of filling in the intervening three centuries! The problem then was choosing which eras to write about and which to ignore; I didn’t want to end up writing a History of England with some Regency murders at the end of it. So I focused on personalities rather than eras - I found the historical characters who would come to life for me, and went with them. 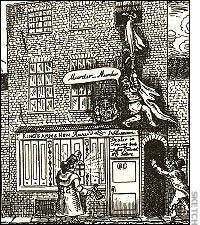 What was the initial starting point for the novel that spurred you into action: the Ratcliffe Murders, the location of Wapping, or the protagonist, the Monster? The murders, definitely. I first read about them over a decade ago, in Alan Moore’s Jack the Ripper story From Hell. They really got under my skin: their motiveless viciousness seemed very modern, very nihilistic. Then I read Thomas de Quincey who wrote about them in his essay On Murder, which pretty much set the template for the modern detective story. So in some ways the Ratcliffe Highway murders are the quintessential murder mystery. They’re the source for everything that came afterwards. Have you lived in Wapping or nearby? The cover of your novel quotes a local saying ‘God has left Wapping’ – but modern Wapping is far different from the Wapping of 1811. Can the atmosphere still be felt? Your representatives of the law, the River Police Constable and the Magistrate, are operating before the age when the word detective comes into use. Was this part of the interest of this particular story for you, as politics and inefficient investigation played a large part in the Ratcliffe Murders’ story. 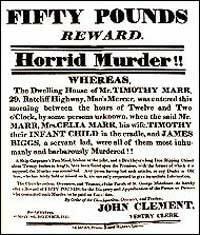 ‘Folk memory’ of the murders lived on throughout the nineteenth century, which given that it happened in one of the areas of east London most notorious for murders has always puzzled me, horrific though the Ratcliffe Murders were. Which aspects of them do you think has caused them to be so remembered? I read that the Highway’s name was changed in the mid nineteenth century, forty years after the murders, in a vain bid to eradicate its notoriety. Yes, the name was changed, first to St George’s Street, then to The Highway, as it is today. And yes, the folk memory was very long - but, when you think about it, not nearly as long as the folk memory of Jack the Ripper, who killed fewer people and whose story is still very much with us. But you must remember that these murders were sensationally famous across Britain at the time; Robert Southey and Thomas de Quincey, who were both in the Lake District at the time, reported how people were double-locking their doors out of the fear which the murders engendered. I think there is something peculiarly vicious, odd and inexplicable about them. I won’t spoil the plot (even though the story of the murders is widely available) - but I think these crimes, more than almost any I can think of, do not lend themselves to rational explanation. And that’s why they resonated for so very long. Has your experience as a travel writer influenced and helped in this novel? Well, I don’t have that much experience as a travel writer! Just a couple of articles. And in actual fact I didn’t travel to most of the far-flung places in the book. I had to imagine them, from contemporary writings and current descriptions. And, of course, photos - the availability of photos of these places from an army of tourists is a small miracle, and a boon to any writer’s imagination. Did you find history your friend or your enemy as you plotted and researched the novel? Sometimes the facts dovetail beautifully with a plot, sometimes they don’t. How did you deal with either or both? Excellent question! Yes, I did try to cleave as close as possible to real events: their timings, in particular. And that does box you in at times. But it also frees you to be creative in other ways; it’s what an old boss of mine used to call “Apollo 13 creativity”, the idea that if you put limits on people they tend to be more, not less, creative. So sticking to the timelines, both in 1811 and in the previous 300 years, meant I had to come up with believable stuff to account for those timelines. And after all, the dates are real - things did happen over those periods of time. Once your readers have recovered their breath from reading this novel, they’ll want to know what comes next. This would seem to be a standalone novel, and if so you planning to write modern crime novels or more historical novels. Are there other monsters about to materialise? Well, my second book is actually a sequel to this one, with the same investigators pursuing mysterious events related to a ship returning from Tahiti. Unlike in The English Monster, the story is entirely fictional, although many of the characters are real. Harriott and Horton will return as the central characters, and just like in The English Monster I’m trying to write historical fiction with a supernatural twist. All is not what it seems. I like to think of it as a Regency X-Files! Thank you very much for agreeing to answer these questions and all good wishes for the novel and for the Monsters that follow.